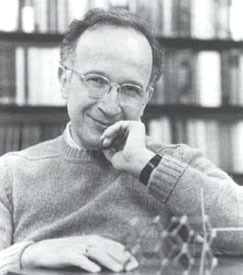 American chemist Roald Hoffmann used quantum mechanics to help reveal the mechanisms of chemical reactions. He was born Roald Safran in a part of Poland that is now in the Ukraine, where he and his family were imprisoned in a Nazi labor camp when he was a child. His father arranged an escape for Hoffmann and his mother, for which he was executed. Mother and son spent the duration of the war hiding in a schoolhouse attic. They made their way to America after World War II, where young Hoffmann attended public schools, and his good grades earned him a Westinghouse science scholarship to Columbia University. In 1963 he introduced the extended Hückel method, a molecular orbital theory which allows calculation of the electronic structure of molecules. In 1965, in collaboration with Nobel laureate Robert B. Woodward, he introduced Woodward-Hoffmann rules, a method for exploring the electronic structure of transition states and intermediates in organic reactions. Hoffmann and Japanese chemist Kenichi Fukui shared the Nobel Prize for Chemistry in 1981; Woodward had died two years earlier, and thus was ineligible. At Hoffmann's urging, a memorial to the dead of the Holocaust was erected in his hometown in 2009. He is also a published poet and playwright. Has described himself as "an atheist who is moved by religion".